Dr. Kristy Dye is Dr. Stanislav’s youngest daughter. She is a Clarksville native. She and her husband Josh Dye were married in 2012. Josh is an Electrical Engineer who is also from Clarksville. Kristy and her husband have two cats named Biscuit and Wendell. Dr. Kristy graduated from the University of Tennessee dental college in 2012. She received her BS in Chemistry and Biology from Middle Tennessee State University in 2008. Dr. Kristy minored in Spanish there and is still fluent in the language. Throughout her academic career she has been involved in numerous organizations and committees and has been recognized for doing so. 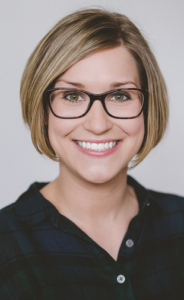 In dental school, Dr. Kristy received the Senior Student Dental Award from the Academy of General Dentistry for outstanding accomplishments in comprehensive dental care. She was also in the Senior Honors Program and accepted an award for Excellence in Pediatric Dentistry. In addition, she served as class representative to the American Student Dental Association all four years of dental school. If asked, however, she will tell you her favorite recognition from dental school was being selected among her classmates to assist in a root canal for a Malayan Sun Bear at the Little Rock Zoo in Arkansas! Prior to working full time with her dad, Dr. Kristy gained extensive experience working as a public health dentist at the Matthew Walker Clinic in Clarksville for over two years. She has also worked Saturdays at Dr. Stanislav’s office during that time. Dr. Kristy loves working with her dad and both enjoy learning from each other. Dr. Kristy is currently a member of the American Dental Association, the Tennessee Dental Association, the 8th District Dental Society and the Academy of General Dentistry. She is dedicated to her profession and regularly attends continuing education courses. She is also involved in our community and volunteers often for various local organizations, including those that promote oral health. She leads and teaches a local discipleship group for women. She attends Grace Community Church where she serves as a large group worship leader for children in the kid’s ministry. Dr. Kristy enjoys spending time with her family and friends. She is a social person who loves meeting new people. For fun, she and her husband like to go fishing. Her other hobbies include reading, running (very slowly), kayaking and canoeing.